This is the one re-issue I've been waiting for but there is a bit of a problem: not many other Procoholics will agree with me, but this the best record of 'The Chrysalis Era'. As a fan, or better adept, from the very first we heard of them I enjoyed their use of lyrics that fit perfectly with the music. After Live, Grand Hotel and Exotic Birds & Fruit here was again an album that used all the instruments for creating an atmosphere, just as they did during the Regal Zonophone era. Although if Procol, or rather Gary and Keith, had a say in it all the effects might differ from the choices made by Leiber and Stoller, according to Roland's extended liner notes. But they chose not to do the production themselves, but to turn to the people of whom, in the early days Gary and BJ covered so many compositions. Leiber and Stoller's achievement was that you did not hear all instruments all of the time. Thus the sound improved and it was less tiring to hear this record than its two predecessors. 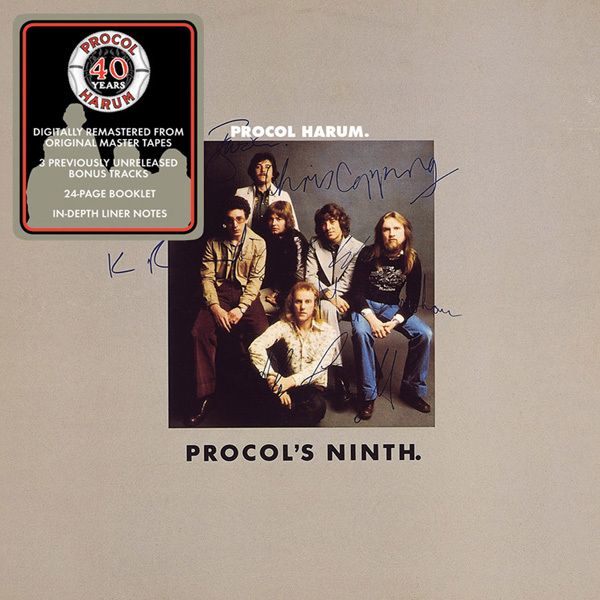 If you play all the Brooker/Reid compositions and leave out the two covers, which is nowadays easily done on any CD player, than you hear a Procol album consisting of eight great songs. Starting off with Pandora's Box and ending with Typewriter Torment. And indeed, this record opened up Pandora's box: the first Procol album including two (!) covers. It was unheard of Procol to do so. And why on earth did they turn to compositions by others? Did this indicate writer's block? One can argue whether the production should have allowed more organ, should have gone easy on brass. But that is neither here nor there. There are eight compositions of which the music was written by Gary and the lyrics are definitely Keith's. There is nothing Leiber or Stoller about those songs. There are eight great songs that invite the listener to make up his own mind as to what is meant by the lyrics. Again opening Pandora's box, for the listener again has to think and that is quite different from the two predecessors which had much more easily accessible lyrics than Ninth. One has to remember that it is easy for a lyricist to state that what we, the listeners hear, or better our interpretation of what we hear, has not been his intention – after he has heard the arguments of the listener. This is the same for many authors of great works of literature and their readers. But when asked they never share with you what they really meant. And yes, they are the only people who exactly know the meaning of their lyrics or their great work of literature. But we combine what we read with our own experiences and emotions and then give an explanation of what we think we heard or read. And that is what literature is about, isn't it? It is exactly the same with song lyrics. They are poems set to music and adapted to fit into the musical background. Thus sometimes we repeat a verse and call it 'refrain' or 'chorus'. So whatever Keith says the song is about, you must not believe him but make up you own mind about what it possibly could mean for you. That has always been the attractive side of Procol Harum, the combination of words and music and the journey to discover what was meant by the song. They have such a good wordsmith that after 42 years we are still wondering what A Whiter Shade of Pale is all about. Because the text is so cleverly written that it keeps inviting us to ascertain the deeper meaning of it all. Generation after generation. And that is what Procol's Ninth is all about. Listen to the music, listen to the lyrics, do not bother about those two covers. Just listen, because that is what makes Procol worth being a fan of. Is The Poet (Without a Doubt) really about writer's block and is Typewriter Torment really about Gary being fed up with playing keyboards? Or is it describing his addiction to playing keyboards? Must be a terrible ordeal if a doctor is needed. And is Taking the Time perhaps about Gary's intention to do something and putting it off to tomorrow, as he once stated in interview as being one of his problems? (interview with Gary after the release of Echoes in the Night). And is Fool's Gold about saying sorry to Matthew Fisher in reply to the complaints about the early days of Procol that he made on his solo album, Journey's End? This was stated in a piece in the periodical Oor by Constant Meijers, another great Procol fan and also the then editor of this periodical. The contrast to all this lies in the cover versions on this album, of which the meaning are so clear that you do not need the go deep into the meaning of the lyrics: they are just good songs, one with a lot of humour in it and the other straightforward. But to use this as an indication of a supposed writer's block ... Just because you have to listen to the lyrics and you can make up all sorts of explanations, of which the origin can be found in the record as it was released, including the two covers that is (are they really an indication of writer's block or did they just go for something completely different?). Is Without a Doubt really about Keith's and maybe Gary's writer's block? Choose your own examples. And is the meaning of The Final Thrust about this being the last record of Procol Harum, or is it a song about not giving in, and thrusting forward and producing something magic like in the earlier days? And then there are questions like “Why was the only hit Pandora's Box, an old composition from the early days?” Or was Pandora's Box the opening song to warn us all of what was to come in all those other songs? Did those songs contain Procol's plagues released from Pandora's box? You can make all sorts of explanations without ever hitting the real meaning, and that is what makes this Procol record such fun. Although not so much fun as the lyrics of A Salty Dog (the song). But still very enjoyable. This is a Procol album in optima forma which brings back memories of the early days, with those mystical lyrics that makes you wonder what it is all about. It was not the first album with a little bit less prominent organ, nor would it be the last. Although I am a great fan of Matthew Fisher's organ playing, Home is for me the best album of the Regal Zonophone era and Ninth the best of the post-Broken Barricades era. The touring for this album was the last time Procol Harum performed in the Netherlands, in December 1975, as BJ put it during the concert: they played Father Christmas and treated us to a set where they accompanied Frankie Brickyard Blues Miller. They did that with great enthusiasm, compared to the rest of the performance. There was a huge difference between the way they played the songs from Ninth and those on the record. It was a wall of sound and I disliked it very much. Ninth was a welcome change from the sound of Grand Hotel and its follow-up. I still consider these records the worst they ever made, with Exotic Birds & Fruit the absolute worst, although there was during that period one great track, Fires (Which Burnt Brightly), that remains high on my favourites list.